Email management is an essential element when it comes to prospecting. You can easily set a future send date when you send emails from within an opportunity. 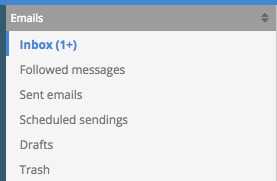 In the email composition window, select Schedule sending. The scheduled email appears in the Scheduled section of the email panel. Before delivery time, you have the option to edit or delete the email. How do I create custom e-mails templates?